Visit Basque Country at Euskadi in Rotterdam! There is a new hotspot in town: restaurant Euskadi. Recently this Basque restaurant opened on the Westewagenstraat. At Euskadi they serve authentic ingredients from the Basque Country, a Spanish region where love for food is deeply rooted in their culture. Recently Mathilde and I visited Euskadi for a delicious press dinner, where they surprised us with delicious, contemporary dishes. 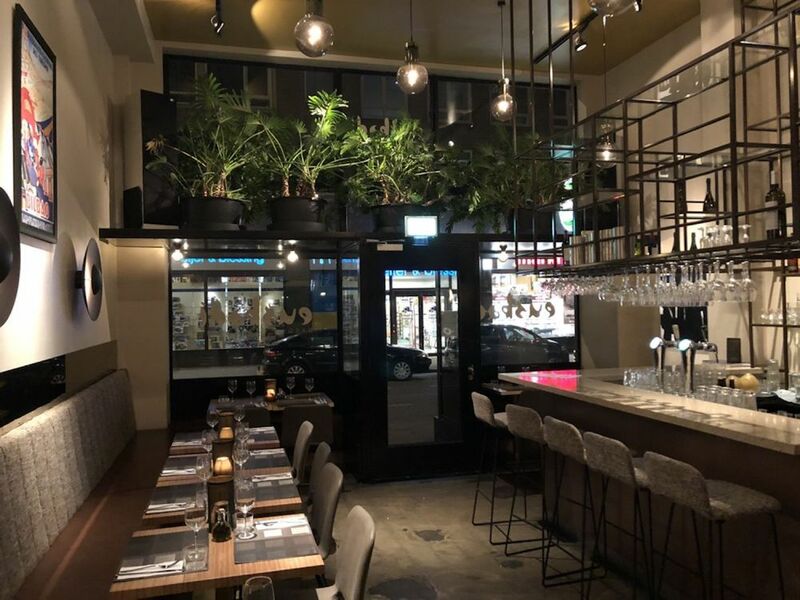 Read more about this new restaurant in Rotterdam below! Travel to Basque Country at Euskadi in Rotterdam! What can you expect at Euskadi? 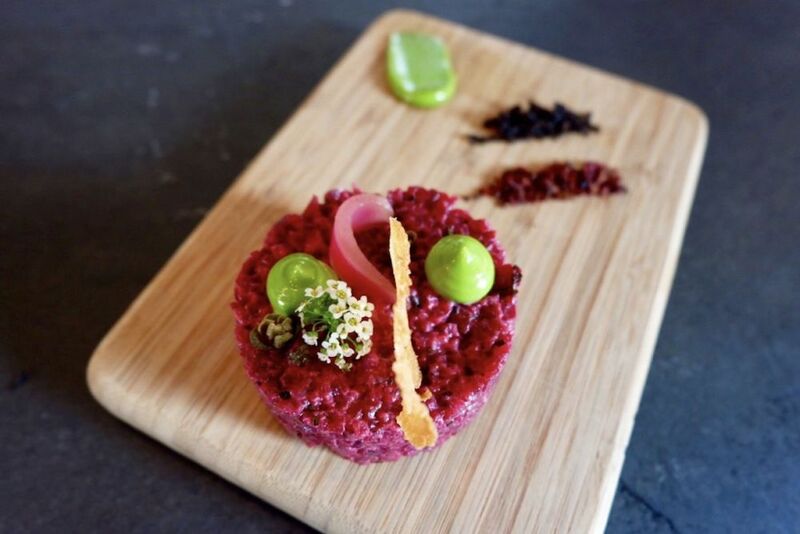 After four years of secretly dreaming about their own project, it finally happened for owner Dennis Azkaiturrieta and executive chef Alvaro Martinez (who has experience at three Michelin star restaurants). With Euskadi, which is Basque for the Basque Country, they want to make the Basque gastronomy accessible. In the Basque Country the whole day revolves about food. Not surprisingly though, as Basque Country offers many opportunities for good food: the fertile maritime climate, extensive vineyards, mountains and a long coastline. Think of good wine and fish and meat of good quality. The Basque chefs are also not afraid to experiment. In short, at Euskadi you can taste from the delicious Basque gastronomy. On the menu of Euskadi you will not find the famous pintxos, but tasty dishes made with special ingredients. You will find delicious meat and fish dishes prepared with products from the North Spanish region. You really taste that the dishes are made with love and passion. Recommended dish: the Sopa de Ajo, a surprisingly tasty garlic soup with a soft-boiled egg, spicy croutons and mushrooms. 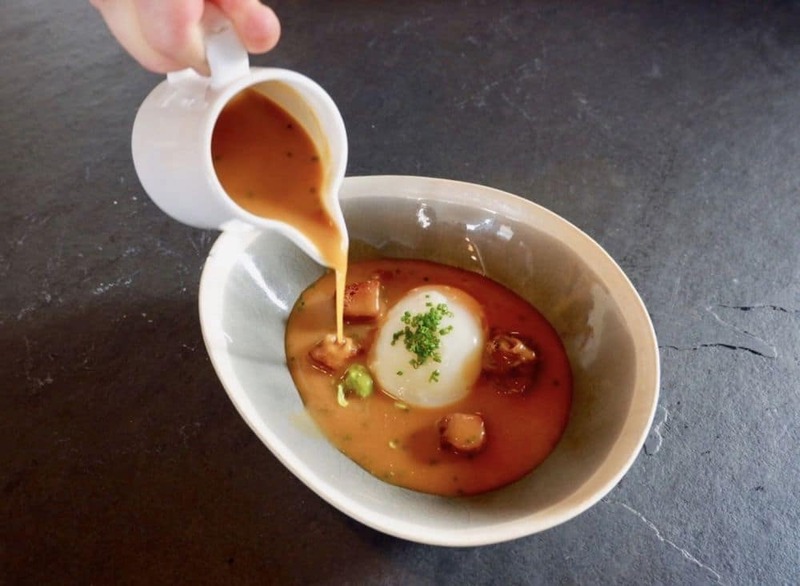 I love it when the ingredients are already on your deep plate and the waiter pours the broth over it, which is the case with this dish, as it just adds to the experience. I also recommend the cheesecake. It’s not a traditional cheesecake, but a cheese mousse with raspberry, jam and almond crumble. Really very tasty! At Euskadi you can go for some fine wine, such as the lightly sparkling txakoli wine, but you can also choose white wine, red wine, tinto or cava. Soon they will expand their menu with tasty cocktails. During the press dinner we have already tasted the Vermouth Euskadi: a cocktail with elderflower syrup. Highly recommended! All starters cost €8, all main courses cost €22 and all desserts cost €7. So, for a three-course menu for two people you pay €74. In terms of drinks, it all depends on what you order. Visit the website of Restaurant Euskadi for useful information, such as opening hours, their menu and more. Are you going to visit Euskadi? Share your experience in the comments below!